London-born vocalist and composer Joanna Wallfisch produces a towering achievement with this new album of (mostly) bittersweet songs and rich arrangements, using a large sonic palette to dramatic and highly musical effect. Blood & Bone comes across as being about journeys: some with regret, some with misgiving, some with optimism. Wallfisch’s voice is a thing of beauty – pure tone, fine range, with a hard quality underlying the softness and delicacy she brings to her performance. Many of these songs ride along with memorable hooks and chord sequences. What really makes this an outstanding collection is the rich instrumentation and creative use of instruments such as bass and drums as key parts of the melody, not simply as backing. These 14 tracks overflow with creativity and great use of musical resources. The album is bookended with two memorable songs. The Ship has a dreamy quality with top-class bass work from Pablo Menares. Jesse Elder handles the piano and keyboard work with great sensitivity and produces a rippling backdrop for Wallfisch’s lyrics about setting sail. 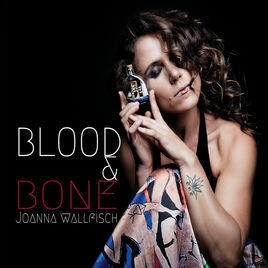 At the other end we find the title track Blood & Bone, looking back on the voyage, with Wallfisch’s own delicate ukulele accompaniment supporting her own multitracked voice, first in duet and then quartet form – a dramatic conclusion. In between, there is a great variety. Dandelions provides an uplifting moment, with a loping feel and excellent delicate drum work from Kenneth Salters (a master of brush-work, as he shows again and again through the collection). Lullaby Girl shows Wallfisch’s composing talents as it builds towards a cllmax with Elias Meister’s guitar solo bringing David Gilmore’s work to mind. Summer Solstice features the Solar String Quartet in a rich and sophisticated arrangement adding texture to this relatively simple ballad. Bo Ba Bo provides a joyful moment of exuberance, with the Songbound Children’s Choir of Mumbai joining the band in the looping bouncing backing figure – a real stand-out performance. There are so many exceptional and beautiful moments here that it’s hard to list them all – get the album and go on the journey yourself. How does Joanna Wallfisch transfer all this mastery and subtlety to the stage? Well, we get to find out in August when she brings her show The Great Song Cycle, Song Cycle – about riding the Pacific Coast Highway in California for 1,154 miles on a bicycle – to the Edinburgh Fringe from 13-25 August.